Shooting at LAX — Portraits, Corporate Storytelling, and Reportage Photography based in Washington, D.C.
Last Friday, I was at Los Angeles International airport to fly back to Houston after a two-week dream assignment following and photographing an internationally popular rock band (blog post TBD). The show the prior night was insanely good, plus it was Halloween. With two weeks of travel and shooting behind me and three hours of sleep the night before, I was looking forward to chilling out, reading and dozing on my way back home. As I waited at my gate, a group of TSA agents walked into the area, calmly, and announced we were to evacuate the terminal. My first thought was that there must have been a fire alarm somewhere. However, I didn't hear or see any alarms. Once on the tarmac, I noticed three news helicopters hovering above the airport and knew that something bad had probably gone down. I later discovered a man, Paul Anthony Ciancia, had shot a TSA officer and wounded many others. He was eventually shot and transported to a hospital. Meanwhile, myself and my fellow passengers were escorted onto the tarmac and eventually moved to an international terminal to wait until the airport was cleared. I moved a couple of photos to twitter, not really expecting the deluge that followed - lots of retweeting and requests from news organizations for licensing permission. One of my panoramic images was used on Fox News and countless other websites. Although my professional gear was packed away, I knew it was only a matter of time that I would be compelled to break it out and put on my photojournalist hat. I ended up shooting some exclusive photos for one of my best clients, the Houston Chronicle. We stayed in the international terminal for what felt like forever, but in actuality was only a few hours. I eventually made it home at 1am the following morning. A longer edit of the images can be seen here. 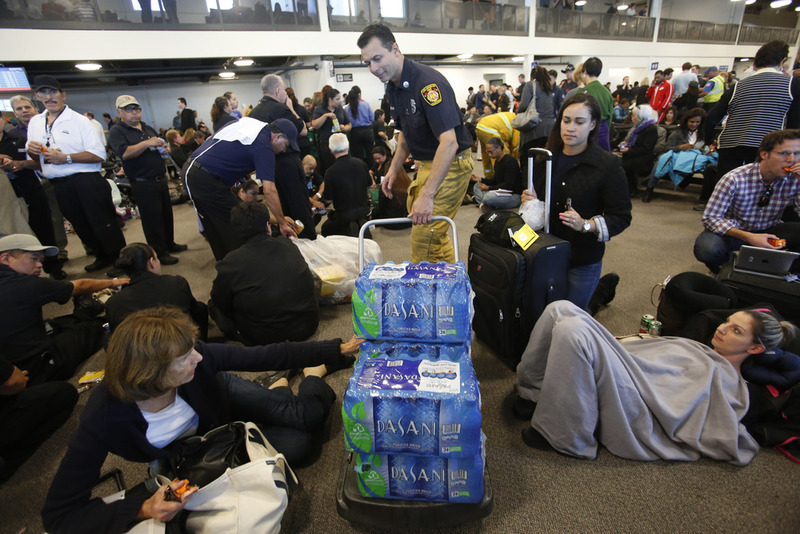 Passengers wait outside terminal one of the Los Angeles International airport eventually being moved to the international terminal following a shooting in terminal three Nov. 1, 2013 in Los Angeles, CA. Shepherd Smith uses one of my twitter photos on his breaking newscast. Where we ended up for a few hours. Another view of the terminal where we were sent. A good time for a carpet nap. Thank you for visiting Los Angeles. Places to charge one's device were at a premium. 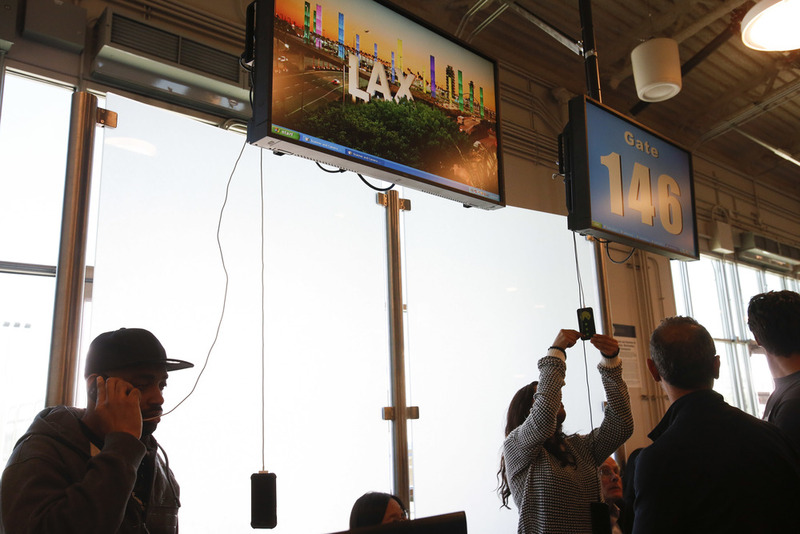 Here people use the USB ports behind monitors over the gate desks. …which was promptly and quickly scooped up by passengers. Water was wheeled through to wash down the snacks. A police officer speaks to Riccardo Angiolini, 16, center, who witnessed the shooting. Passengers were eventually released. The volume was huge, so many passengers walked in the street.